And the related FAQ: Where can I find the Office Proofing Tools? The primary purpose of Office language packs — now called language accessory packs for Office 2016 — is to change the display language of Office menus, dialogs and Help into your native language, just as Windows language packs do for the overall system. But they are accompanied by a free handy toolset you can use across languages: the Office Proofing Tools. In the past, many users purchased Office language packs only to obtain the proofing tools, but in recent versions all or most of these tools have been made available for free separate download. Office Proofing Tools include an option to right-click and select "Translate" from the context menu, and a "Translation ScreenTips" feature that displays explanations in another language while you hover over buttons and other options in the program. The proofing tools will also allow you to sort Simplified Chinese by number of strokes or Pinyin, and Traditional Chinese by strokes or Zhuyin. In English and most other non-Chinese editing languages, Hanzi will sort by Unicode code point values. That is generally in Kangxi dictionary order, although I believe it gets weird once you get into the number ranges of rare characters. But after installing Chinese proofing tools, sorting in Word and Excel will work the way most Chinese speakers expect. 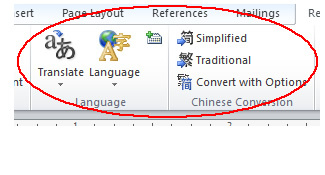 See the FAQ page on sorting Chinese characters in MS Excel and Word for instructions on setting up and using this feature. Simplified/Traditional Chinese character conversion is also included. In recent versions of Office, that feature lives in the Review ribbon. If you try to run that converter and get a message saying "More than one file necessary to do TC/SC translation is missing", you don't actually have the feature installed and will need to download proofing tools or a language pack by following the instructions below. For Office 2016 you can download entire "Language Accessory Packs" free, including Chinese display (ribbons, menus, dialogs, and more in Chinese), Chinese help, and Chinese proofing tools, in separate packages for 简体 and 繁體 direct from the Microsoft Office 2016 Language Accessory Pack download page . For Office 2010 Microsoft offers a free download of Chinese ScreenTips and they were selling single-language Office Language Packs with the proofing tools included (for USD $24.95 each, in 简体 or 繁體 versions, with Chinese-language installers only), but last time I checked those language packs had once again disappeared from the Microsoft Store and other sites.